This has breath-taking Blue, Yellow, Black and Gray logos on a White T-Shirt showing the Grim Reaper chasing you on the Breathless Agony Course as well as "Now - Go Elevate Yourself" on the Front. Awesome colorful logos on the Back. This design does not include the year on it ... so anyone can order them regardless of whether you finished 2, 3, or 4 Passes. You can even order one if you've never even signed up for the ride!! These T-Shirts will be available for sale at the Finish at Sylvan Park in Redlands!! 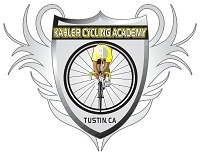 If that doesn't work for you, call Robert Kahler at (714) 544-6091 and drop by Santiago Cycling at 115 North Prospect in Tustin. If you'd like us to ship you a T-Shirt, there is an Order Form Here.